Got any summer birthdays coming up and don’t know what to get for your mum, sister, best friend or whoever? NEVER FEAR. Because I just found out about some amazingly foodie gifts that dare to be different. As they’re all on the theme of flowers, they’re perfect for summer. And surely every girl likes chocolate…right?! This first one shouldn’t even melt in the sun, and even the least green-fingered (like me) should be able to get them to grow. They’re CHOCOLATE FLOWERS. YES. GENUINELY. Straight out of Charlie and the Chocolate Factory, these sprout flowers that smell of chocolate. The £9.95 kit (from Prezzybox) includes everything you need to get started, including pots, compost, chocolate-scented daisy seeds, and plant markers. An original gift that’s rewarding on so many levels – especially for those who are dieting! At £5 per posy, they’re not cheap but look divine. 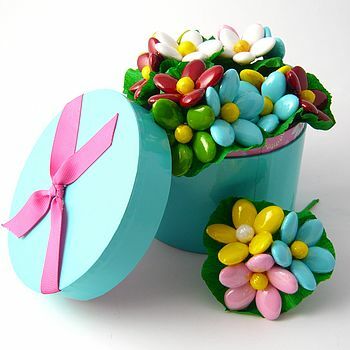 Created in Italy and made partly from sugared almonds, they’re then pulled together with crepe paper for a delicate gift. 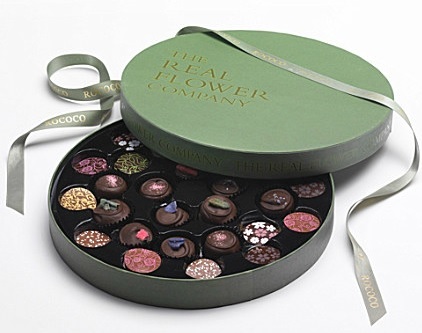 NotOnTheHighStreet also offers chocolate roses priced at £7 for nine small ones or £40 for 5 large ones (and by large I hope they mean ‘the size of your own face’). When Lucky’s offered to send me a free box of their chocolates, I jumped at the chance (come on, free chocolate? You wouldn’t be able to resist either). The main draw for me was that unlike most commercial chocolate (as opposed to ballotin-ridden, artisanal, sold-in-posh-boutiques chocolate), Lucky’s focuses on using Valrhona chocolate (which I believe I’ve already spoken about at great length). However, they are no ordinary chocolate company, firstly for their focus mainly on cake, and secondly for their Alice in Wonderland theme. I was initially a little disappointed when the box arrived due to the Alice in Wonderland theme not being as obvious as I’d hoped. When I showed the box to my husband, and asked him what it reminded him of, he promptly came out with the name of some modern art guru that nobody’s ever heard of. A far cry from the white rabbit and Mad Hatter, then. But let’s get to the important stuff: the cakes. 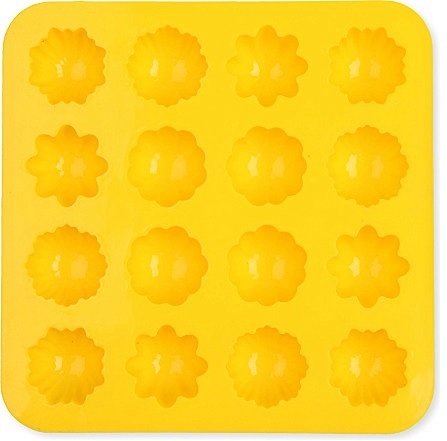 They’re roughly Fondant-Fancy size, are square, and have the Lucky’s logo on top of them. On the website, you can create the box by choosing any combination of 12 cakes from the following flavours: Salty Insanity, Going Bananas, Looney Raspberry, Fruity Rhapsody, Chunky Nutter, and Mocha Madness. However, my box contained not only 2 Looney Raspberrys, 2 Coco Rush and 2 Chunky Nutters, but also one each of Salty Insanity, Fruity Rhapsody, Fancy Fudge, Hurry Bunny, Nutty Delay, and Sour Kick – of which half, as you will have noticed, are not available on the website for selection for this particular gift box. Curiouser and curiouser, as Alice would say. Anyway, it was certainly beneficial to test a fuller sample of the range of flavours the company has to offer. Plus, since they were so large, we were able to cut each cake in two, thus making the box last longer and allowing us both to test all flavours. Despite my husband not being a fan of white chocolate, he enjoyed the Looney Raspberry more than I did, whereas I preferred the Fruity Rhapsody. As you will remember from my toffee-and-caramel-related tirade in my post on Quality Street vs Roses, it was great to see a genuinely diverse selection of flavours available. As well as the fruit versions, there were traditional nutty variants (Chunky Nutter, Nutty Delay, Coco Rush) and a fudge version (Fancy Fudge). Hurry Bunny – a white chocolate, cinnamon and blueberry confection – was risky yet strangely alluring. However, to me the stars of the show were the more innovative creations: namely Salty Insanity and Sour Kick. The former is described on the website as “Valrhona 60% cacao dark chocolate…sea salt caramel notes”, while the latter combines honey cake with apricot compote and 40% milk chocolate. These I could happily eat a whole box of. But what goes up must come down, and unfortunately there were a few downsides. It perhaps goes without saying that the Alice in Wonderland thing needs to be played up far more strongly if done at all. Secondly, and funnily enough, with all of the other flavours incorporated into each cake, the high quality chocolate sadly ended up taking a back seat: in a blind taste test you would not know it was Valrhona. Finally, perhaps the biggest drawback lies in the price; while the flavours are strong and the cakes are well-made, at £35 for 270g net weight, it’s really very expensive for what it is. Fine for a gift at a push, but I would have reservations about spending this amount on myself. Plus, even if I did have £35 to spend on chocolate (or indeed cake) I find myself thinking I would get a better deal elsewhere, whether at a mainstream chain (you can have 1kg of chocolate for this price at Jeff de Bruges, for instance), a posh supermarket (at Marks and Spencer, for your £35, you can have this, for example – which, you’ll note, serves 40 people), or even an independent chocolaterie. So sorry, Lucky’s – it might be a nice idea as a one-off gift for friends or relatives this Christmas, but I don’t think I’ll be joining your roll of regular customers anytime soon.